6 corners of the Hexagon: Fourth corner! The fourth corner of the Hexagon, at least according to the way we mapped out our trip, was the southwesternmost point of France. This is at the Spanish border, in the heart of Basque country, and the French side is Hendaye, one of the largest towns in the Pyrénées-Atlantiques department. The beach is lovely, and from the languages we heard seems to be equally popular with swimmers and sunbathers from both sides of the border. 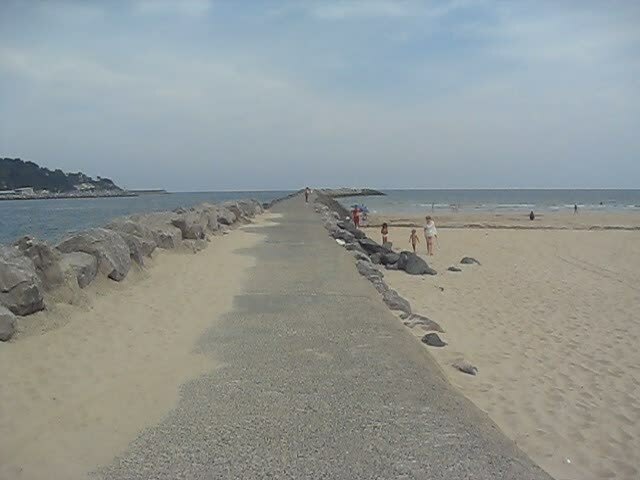 The end of the jetty is the actual corner; to the left (south), across the water, you can see a bit of Spain. Here’s our map between the third and fourth corners. As always, pink indicates our route as well as towns we actually walked around and/or ate in, while blue highlights where we stayed. You can click the map to see a much bigger version (MB).